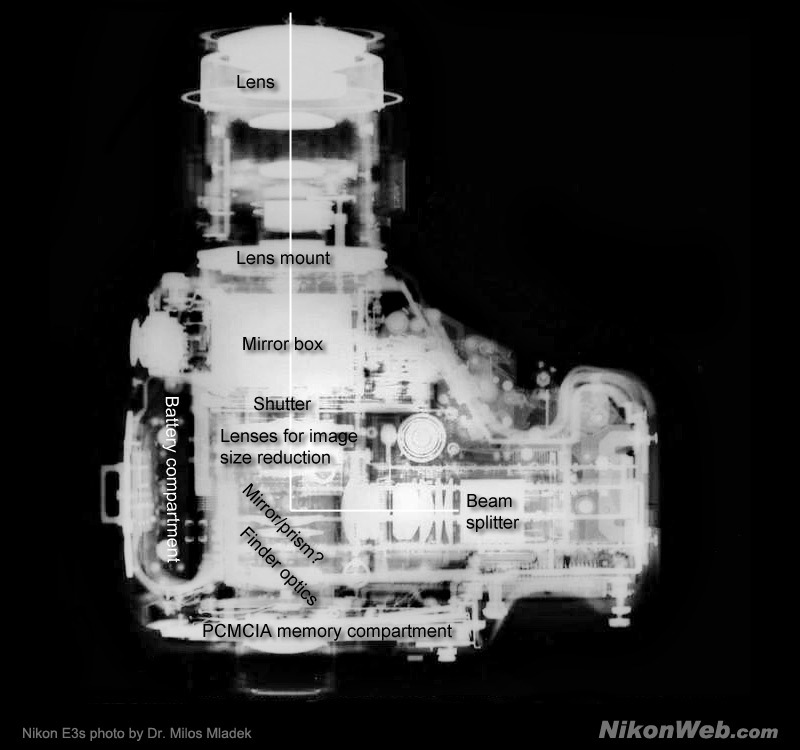 A few years ago, Dr. Milos Mladek bought a Nikon E3s from a shop in Vienna. Curious about the plump body, he decided to take a closer look. "I am a retired radiologist, and before I retired one of my last x-rays was that of my E3s. I could not explain the odd proportions of the camera. The right part seemed overly big - so I x-rayed it, as I always did when I wanted to know the innard of a thing. And the E3s was the perfect object for this: mainly plastics, big, with inner structures of metal, great to make a good shadow cast in x-ray light", Mladek writes. "Normally a mirror should be easily distinguishable on such an x-ray as a line structure in 45 degrees orientation to the optical axis, but there is none. Possibly they used a prism to deflect the light, but I cannot see that either (possibly is is made from crown glass that can be very transparent to the x-rays so that it gets invisible on x-ray images)." Being curious about the strange design and layout of the camera, I asked Mr. Kenji Toyoda, a former planning manager with Nikon's Electronic Imaging Division (from 1988 to 1990). Mr. Toyoda kindly sent me a document describing an early E-series prototype camera, named D1 at the time (not to be confused with Nikon's groundbreaking 1999 D1 body, which is obviously a completely different design). According to an automated and less than perfect translation of the Japanese text (unlike the diagram, most of the document is in Japanese), there's a b/w CCD luminance sensor, a color CCD sensor and a TTL flash sensor. The sensor in the D1 prototype was a only 560,000 pixels, by the way, while the finished E2 came with a hefty 1.3 MP (1280x1000) sensor. The big square seen in the x-ray photo is a beam splitter to direct the light in three directions: 1. straight for the color signal, 2. deflected in 90 degrees for the black and white luminance signal and 3. also deflected in 90 degrees like (2), but then reflected back in 180 degrees to the third surface of the beamsplitter cube for the silicium photo diode of the TTL flash control. Looking at all the optics (both the image reducer and secondary optics in front of the beam splitter) within the camera body, it doesn't really surprise me that image quality is less than perfect. I think all the E-series photos I've seen are a little dull, in lack of a better word (unsharp also springs to mind). They simply don't have the visual punch you'd expect from a $10.000 + camera. Especially when compared to photos from contemporary Kodak DSLR bodies, which didn't even have an antialiasing filter in front of the sensor. As mentioned in the much quoted NC2000 article at Robgalbraith.com: "I don't think there's been a digital camera I've used that is as sharp as that camera, pixel for pixel. It was just amazingly sharp." Again - this was Kodak's NC2000. The E-series cameras simply couldn't compete. At the time (mid-1990's), Kodak sold a lot more DSLR cameras than Nikon (and anyone else, for that matter). But it didn't last. 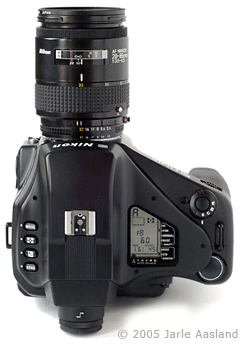 The launch of Nikon's 2.6 megapixel D1 marked the beginning of the end for Kodak's DSLR series. 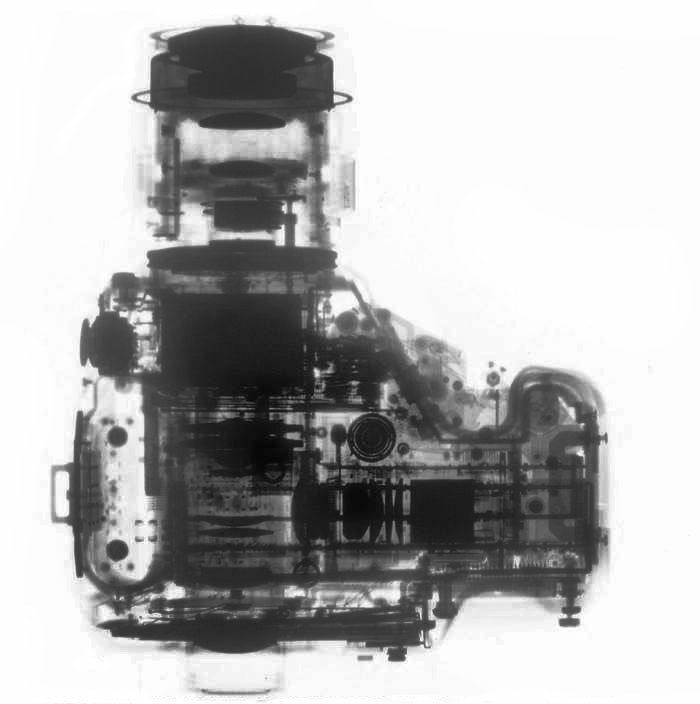 Nikon E3s x-ray photo by Dr. Milos Mladek.